What’s the most valuable asset in your business? A while ago when Brennan Dunn and I were talking about business assets and determined our most valuable assets are the same: our readers. Not the source code of our SaaS products, the copyright on our books, or our websites. The connection I have with my readers is what my entire business is based around, and that is all contained in my email list. Without that list I don’t have a way to stay in touch, share new ideas, or promote new products. Strange to think that the most valuable thing I own can be listed out as a comma separated list. But really it’s not just email addresses, it’s relationships. And that takes time to build. Since I’m open about every other part of my business, I figured it’s time to dive deeper into how I use email. Currently my email is handled with two tools: ConvertKit (my product) and MailChimp. I started using MailChimp exclusively (before ConvertKit existed) and now I am gradually moving everything over to ConvertKit. My email is hosted with MailChimp, but all my new subscribers come through ConvertKit. Once ConvertKit has better list management (like MailChimp does) I plan to move everything to ConvertKit. Until then, I’m pretty happy using both tools. Update: ConvertKit now has list management and broadcast (one time email) functionality. So you can do this entire process inside of ConvertKit. My main list, which I call NathanBarry.com, has 7,053 subscribers. Those came from a ton of different sources, but the list grows at a rate of about 400-500 subscribers per month. In the coming months I plan to get more aggressive with how I collect emails and what incentives I offer visitors for subscribing. Inside MailChimp I have groups for tracking how each subscriber got on my list. About once a month I import my customers from Gumroad (unless they requested I not contact them), as well as anyone from other sources. Each subscriber is imported into a specific group so that I can contact an individual segment later. This lets me send a design tutorial just to people who expressed interest in one of my design products, or send an email to everyone who signed up to hear about Authority before it launched, but haven’t purchased it yet. The only downside is for that to work the buyer would have needed to use the same email address both for the subscription and then later for the purchase. Even with that powerful segmenting capability I still send over half my emails to the entire list. When a visitor subscribes to any of those they are immediately emailed the incentive, when they download it, their email address is automatically confirmed behind the scenes. Instead of receiving an email that says “Confirm your subscription” the email says “Download your free PDF” or something else specific to your offer. This process feels much more natural to the subscriber and is a much better experience. MailChimp prevents you from changing the button text away from the default “Confirm your subscription,” but you can hack this together using their translate feature. It’s a hack to translate from English to English, but that’s how you have to do it (or you could just use ConvertKit). Multiple forms—each with a different incentive—require creating multiple lists in MailChimp. You would then have to manually merge these together every month or so. I actually use the ConvertKit WordPress plugin to add forms to the bottom of each of my blog posts. I can set a default form, but also override it with something more appropriate for a specific post. So a marketing post will feature something on conversion rates and a design post will use my CSS3 incentive form. In most cases I don’t just drop a new subscriber directly onto my main list. Instead I let them opt in to an email course specific to the incentive they were interested in. Someone interested in my Designing With CSS3 videos has the option to also get a free 30 day course on designing better web applications. These courses let me pre-plan the content that I want each subscriber to receive. More importantly I can gradually promote a product to them. After spending several emails teaching about design I casually mention my book, Designing Web Applications. After that mention I move right back to purely educational content. Later in the series I’ll bring up the book again. Note which emails include a sales pitch. For most it is just a casual mention, but I always have one email in the series that is focused on pitching the product. But again, I’m pitching a product after I’ve spent over two weeks teaching valuable content. Here’s an overview of how I get new subscribers on my list. At the top is the source—either an embedded form (usually at the end of a blog post) or a dedicated landing page—followed by the email course those subscribers get added to. Once they finish the course I export them to MailChimp and add them to the appropriate group in my email list. I’ve known email courses (or auto-responder series) are a great way to gradually sell content, but I always resisted setting them up since it was such a painful process. Now that ConvertKit makes it so easy, I’ve got six active courses running with plans for a few more. A lot of new subscribers have come from deals I’ve run with AppSumo, Dealotto, and Mighty Deals. One of my conditions for running all of these deals is that I give new purchasers on those sites an opportunity to opt-in to my email list. I’ve picked up about 1,300 subscribers from running a few of these deals. Up to this point it’s been all about the tools and setup, now let’s talk about the details of the actual emails I send and their stats. First I use very minimal email templates. MailChimp and other tools advertise beautiful email templates. I take all that and strip it down to almost plain text emails. My emails look like they could have been sent in Gmail—all because I want them to feel personal. Because of the personal style I get a lot higher engagement and if I ask a question, readers are far more likely to reply. I wrote a lot more on email templates here: Why beautiful email templates hurt your business. Open and click rates depend heavily on the quality of my subject lines and what is actually in the content of my emails. My worst open rates are about 40%, but 45% to 50% is average. I’ve been able to get as high as 78% before, but that was only to a subset of about 700 people. Click rates vary even more. If I put the full content (usually a blog post) in the body of the email than click rates will be very low (3% to 10%). But if the email is short and mainly contains a link (like a book launch announcement) then click rates will be as high as 30% to 50%. A low click rate isn’t necessarily bad—it’s just dependent on the content of the email. My favorite writing trick is to write to a specific person. I know what problems or concerns they may have, and I can preempt them in my writing. It also helps keep me from sounding too pretentious. Write the person’s name at the top of the email “John, “ then follow with the rest of the email.Once you’re finished writing just switch out the name for something generic (or the recipients name if you have that stored in your database). These personal style emails work well combined with my almost plain text emails. I very happily pay MailChimp $150 per month. I could get this a bit lower by removing a few lists that I am not using at the moment, but it’s not worth it to try and save a few bucks. My usage of ConvertKit comes in at the middle plan for $125 per month, except I created the tool, so I don’t have to pay for it. These email strategies have made me tens of thousands of dollars, so paying a few hundred dollars a month is a great deal! Why? Because it is predictable. One-time sales result in a massive spike at launch, usually followed by a rapid decline, and then a few sales each day for a long time. I’m not complaining about the money from it, but a business revenue chart that goes down over time is not the best business model. Products with recurring revenue are predictable. Instead of a one time sale, you ask for a subscription (this works best for software products), so each customer pays you every month they use the product. A certain number of customers will cancel each month, but if you can add a few more than cancel each month, revenue grows. It’s predictable and consistent growth. That’s what you want to see in a healthy business. Relying on other traffic sources is like waiting for those massive spikes in sales. They typically aren’t sustainable. A huge spike in traffic, like I saw in November 2011, is often followed by nothing the next month. But email subscribers behave predictably over time. 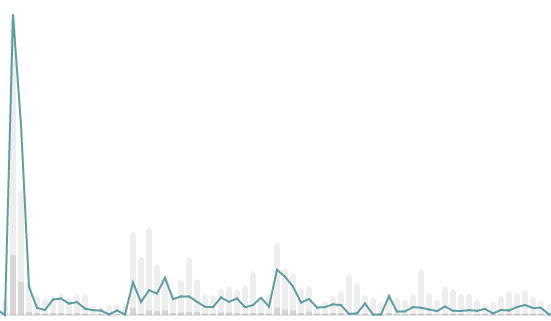 That chart is the email subscribers to my blog over the last 8 months. Every month that I add a few more subscribers than the number that cancel—the subscriber count increases. Best of all, I don’t have to hustle for new visitors to every single blog post. Email gives you all the benefits for marketing that recurring revenue gives you for business. Then when you do get those massive spikes in traffic, you can get a portion of the visitors on an email list, all so you can stay in touch and continue providing value. And that is the biggest reason I love email—and you should too. If you are thinking of using email better in your business, take a look at ConvertKit. Nathan, learning how you segment your email list was awesome. Thanks for sharing, especially in this level of detail. Can you go into why you chose Mailchimp over Aweber / other email service? I’m always hearing different views on this and would like to hear your take. MailChimp is modern and continually updated. Aweber looks like it was created in 2002 and hasn’t changed since. The guys on the MailChimp team really care about design and user experience. But not much thought went into the decision—I just started with something. Now that my needs are much more sophisticated I created a platform (ConvertKit) around my own methods (which you should try). Hope that helps! This article is real gold, Nathan. The email blueprint diagram itself is the biggest takeaway for me to implement in my own email list! I found it ironic and curious that the Designing Forms that Convert actually has the lowest conversion rate – 1.2%. But I suspect with such high views, and seeing it on this page, that it’s your default subscription form. Which would mean that it’s not always the most targeted form since it may be shown on a wide variety pages. Am I right? You’re exactly right. Conversion rate has more to do with the traffic and what else is on the page than anything else. That’s my default form for every blog post, so it gets a ton of not very targeted traffic. As your products increase in variety, have you seen a negative impact whenever you decide to send emails to the entire list? Like higher unsubscribe. Maybe, but it’s hard to say for sure. I think I am going to return more towards focusing on design for a while. Great post, love the transparency. The section on segmenting is very useful, as is how you do the opt-in confirmation hack. I’m a big Mailchimp fan too, for the same reasons you gave David in the comments above. Do you recommend that ConvertKit customers continue to use Mailchimp (or another list management tool)? What are your plans for this area? Second question: I might have asked the above question on ConvertKit, but I don’t see a contact method – is that a deliberate funnel optimisation? Actually, I just launched lists and broadcasts in ConvertKit, so now there isn’t a reason to use MailChimp as well. You can do all of it inside ConvertKit without moving to another tool. The lack of contact information for ConvertKit isn’t on purpose. Just another page I need to write and put up. I love using email marketing for many things, but the main reason is so I dont rely on the search engines as much. with an emailing list I dont have to wait on google to send me traffic one simple click can generate traffic with an emailing list. Glad I found your blog. I saw your interview with Pat from Smart passive income podcast. So if you have 6 subscriber sources, are you also writing e-mail content (after they have went through the sequence) specifically for these 6 groups? For instance, I would imagine that the audience for your productivity book is different than your CSS3 course? Thanks for the great post, Nathan! Quick question: what happens to opt-ins that have received all your email course emails (auto-responders) and still haven’t purchased? Are they then moved to a “leads” list? Or do you have a different way to handle that? I am wondering how did you drive traffic to the different forms & landings when you didn’t have a big audience. I am struggling with content marketing and trying to build an audience but I don’t know how to drive traffic to the different landings. Twitter, Hacker News, Subreddits, and personal emails. How did you segment your MailChimp list by signup form? I don’t see a way in MailChimp to distinguish between people who filled out the “Forms that convert” form vs. the “Authority pre-release” form. Let’s say you have a subscriber named Joe. Joe signs up for 3 different courses. While he enjoys the content from the first two, at some point he decides to unsubscribe from the 3rd one. But since he’s in a group inside of one list doesn’t that unsubscribe him from the entire list? In ConvertKit “Joe” would only be subscribed from that one course. Eventually we’ll add some more robust options so that a subscriber can choose to unsubscribe from one or all subscriptions at once. Thanks so much for this article Nathan. Just when you feel like you’re getting stuck in a rut with email marketing, along you come and blow me out of the water. Awesome! I really like the features advertised on ConvertKit and am working on writing some email courses so that I can begin using it but another thing I’d like to offer readers of our blog is the ability to sign up for a newsletter so they get emailed recent blog posts. MailChimp as the RSS-to-email feature which enables you to automate this. I really would like to avoid using both and just use ConvertKit. Do you support or have plans to support such functionality? I am a beginner marketer, and you are really helping me understand! I write children’s books and wonder: HOW do I build an audience of 1000 or more interested moms and dads wanting to buy a great book for their kids? They will probably just type in “childrens books” in google, amazon, and pininterest – but like that they will never find ME because I will come WAY back on page 3000…. So HOW and WHERE do I find my audience as a beginner with no page rank?